Crochet flowers crochet is what startTo deal with needlewomen who have just mastered the basic techniques of handling a knitting tool. This once again proves how simple this task, even children, who can even handle crochet and thread at least a little, can cope with it. 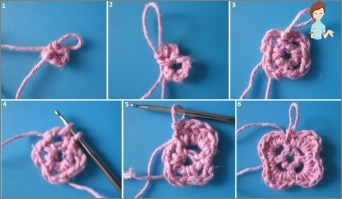 In this publication, you will find step-by-step recommendations on how to tie your first flower with a crochet, which will then decorate the phone case, beach bag or children's panama. So, in order to weave openwork volumeFlowers crochet, you should stock up on the tool itself and yarn. The latter can be of different texture and coloring. Remember that the quality and thickness of the thread depends on the number of the hook you will work with. Standardly, leaves and inflorescences themselves are made of cotton, although if you want to make the product more elegant and solemn, then you can use yarn with lurex. 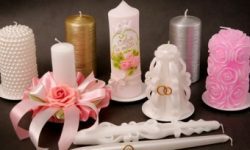 By the way, it will be said, to create flowersVery little consumable material is required, they can be made from different-caliber thread residues. You should also not lose sight of the way you are used to knit - loose or tight. As a result, it is necessary to correlate the desired result withTechnique of its own weaving. 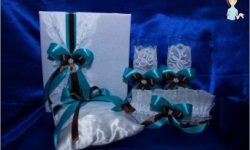 So, for example, if you want to bind a soft and loose product, and you knit very tightly from the very first days, then arm yourself with a slightly thicker hook than the one that should be used according to the instructions. This scheme knitting on the shoulder novice craftsmen who want to decorate their or children's clothes with a sweet and simple flower. Of the available 10 loops, 5 full-blown petals should be obtained. 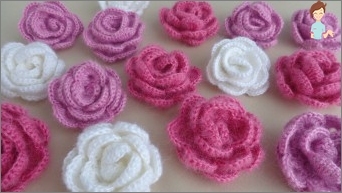 If you want to get a more magnificent flower, then,Tying the first row, do not 10, but 14 air posts without a crochet. But then you have to reduce the number of columns, of which the petal itself will consist, there will be only 3. You can show your imagination here, and use schemes with two or even three overlays. They will allow you to get hanging petals, like chamomile, for example. If you want to complicate yourself a bitYou can use the description of a two-layer rose. To do this, it is enough to tie another row similar to the first, one connecting loop to the base of the product, but on the reverse side. Then, at the very bottom, start forming air loops in this order: an air loop of three loops, connect the arc with a loop, and repeat all this at each subsequent loop. As a matter of fact, all schemes of formation of colors crochetAre reduced to one: you need to get the core and its frame. Next - the case of your imagination: you can create loops to lift any length, leave them empty or fill with yarn, make the product bulky or flat. For example, the core of the inflorescence is permissibleWide, so that it can be fastened with a button to the hat or bag, for which it is enough simply to increase the number of air loops in the very first chain. 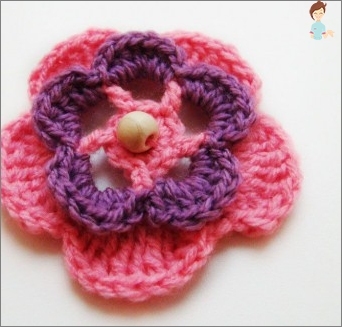 If you use this particular knitting of three-dimensional flowers by a crochet, then remember: their core should not be bigger than the circumference of a button, and even slightly less. Do not forget that all the threads have the property of stretching. 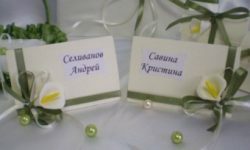 Having connected a few flowers of the same diameter, just fasten them with a button, and you can decorate your clothes. Knitting inflorescences with a large number of petals also has its own characteristics. For example, their core should consist of at least 8-12 air loops, enclosed in a chain-ring. 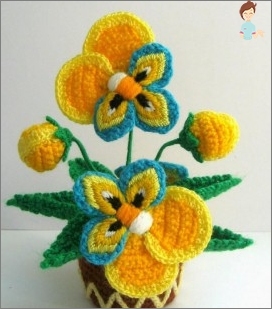 Crochet - This is not just a way to create flowers such as roses and daisies, leaves and other elements. This is a real opportunity to surround yourself with ever-flowering buds that will revitalize your wardrobe and make an image in the spring elegant and fresh.